USB LED Fan Clock: a plug & play fan clock with a flexible metal neck. Powered by USB. 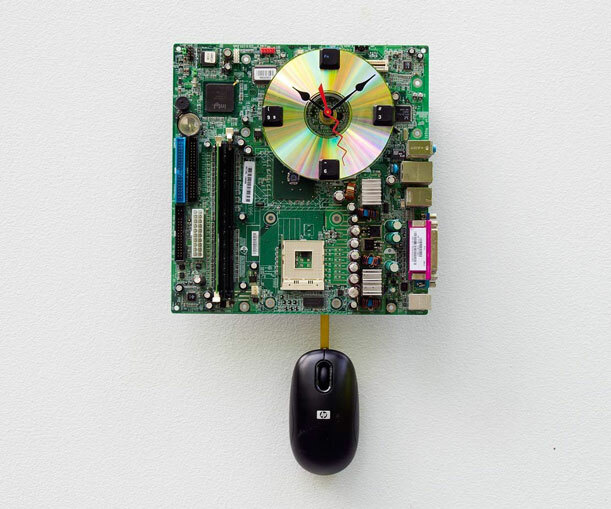 Recycled Motherboard Clock: made from recycled computer parts. The face is a CD with keyboard keys as numbers. 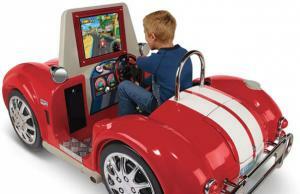 Runs on 2 AA batteries. Plotclock Robotic Clock: an Arduino UNO drawing robot that uses a marker to writes down the time. 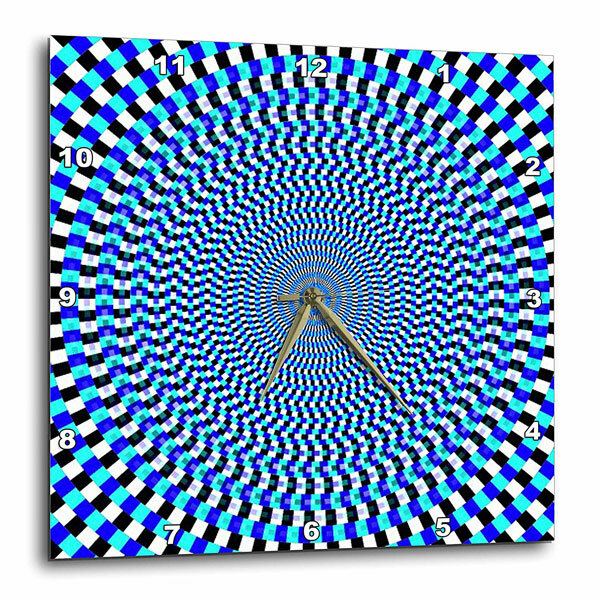 Optical Illusion Clock: I don’t know about you but this makes my head spin. Numbers are painted as a part of the image. 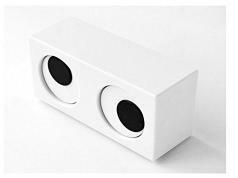 Moire Seconds Optical Illusion Wall Clock: gives you the impression that the cat’s face is changing as time goes by. The illusion is based on the moiré-effect. PAC-MAN LED Desk Clock: has 512 LEDs to display animated Pac-Man and other characters. U.S.S. Enterprise NCC-1701 Wall Clock: another rad gift idea for Star Trek fans. It is an officially-licensed item. 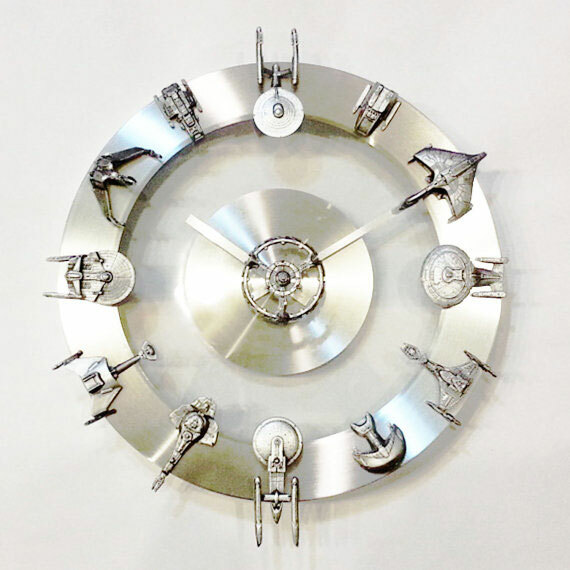 Handmade Star Trek Clock: made of glass and brushed metal, this piece has 12 starships and vessels from the franchise. Star Wars Starships & Fighters Clock: the Star Wars version of the previous item. It comes with 12 ships and vessels from the franchise. 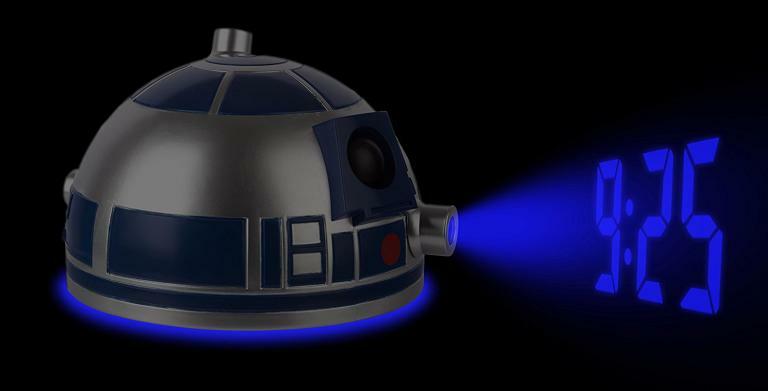 R2-D2 Projection Dome Alarm: projects the time with light and sound effects. BB-8 Alarm Clock: this cute alarm clock comes with official character sounds. Stormtrooper Alarm Clock: this LEGO clock has movable arms and legs. 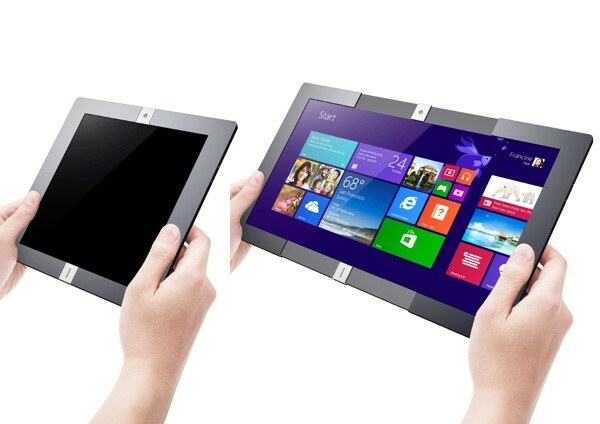 It features a light up display and snooze function. Darth Vader Light Up Alarm Clock: a cute little clock for Star Wars enthusiasts. It lights up in the dark, which is a plus. Kikkerland Gear Clock: has 52 parts, wheels, pallets, springs, and gears to keep track of time. Its 17 gears are powered by two D batteries. Fake Bomb Clock: looks like a bomb with 7 sticks of fake dynamite and digital time readout. You get 16 buttons to adjust time and change modes. Rocket Moon Clock: a design by Andy Mason. It has a moon face with a rocket orbiting it. Glow in the Dark Laser Clock: a DIY clock you can complete with Arduino. It uses a RTC unit to keep accurate time. ClockClock24: tells time using 24 mini clocks. It is driven by 48 motors inside. Time Twister 4: one of the coolest LEGO clocks around. 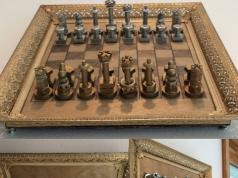 It uses motors to move the pieces and change digits as time goes by. Cosmos Constellation Clock: brings the night sky into your home. It has a full map of the northern hemisphere’s constellations with two stars to tell the time. Electro-mechanical Data Clock: an Alexa connected clock that helps you keep up with weather conditions, solar weather, and more. The clock’s inner ring is for modes while the outer ring shows data that corresponds to each mode. Bicycle Gear Clock: a clock made out of bicycle parts. 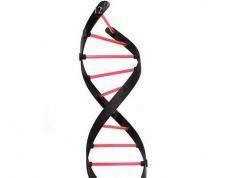 Its quartz mechanism is powered by AA batteries. Retro Donkey Kong Clock: this geeky clock has a touchscreen display, allowing you to easily interact with the characters. It lets you record custom sounds for your alarm. Retro Arcade Pac-Man Clock: the arcade version of the above clock. It has a handcrafted enclosure. Ferrolic: so ferrofluid is your thing? You should give this ferrofluid clock a look. 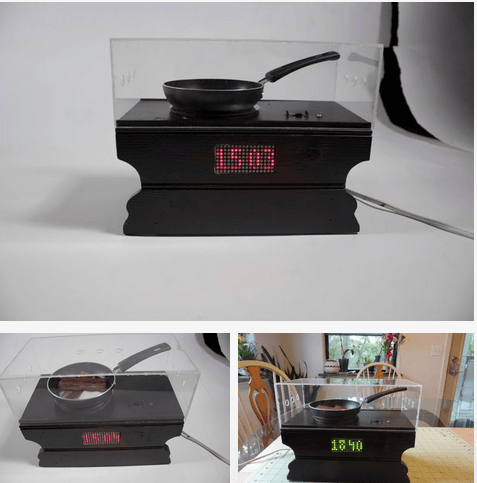 Arduino Word Clock: comes with animated time transitions. It can show your name and personalized messages. City Clock: one of the coolest binary clocks we have seen. It is a clock inside a wooden Parisian Haussmannian building. Arduino Nerf Target Alarm Clock: this can only be silenced using a Nerf dart. 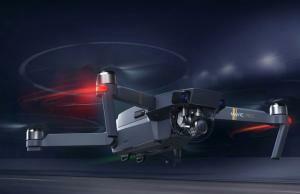 It uses a piezoelectric sensor to detect hits. Perpetual Arduino Clock: one mesmerizing clock made with 6061 aluminum, steel hardware, 3D printed gears, an Arduino UNO, and laser cut plywood. Triple Gear Chain Clock: this wall mounted clock has hours, minutes, and seconds chains to show time in a dynamic fashion. Moiré Clock Kinetic Sculpture: this is really a work of art. It combines the moire effect with lights to project the time from the center. Chronomeans Rolling Ball Clock: this elegant clock is made from rhodium- and 14k gold-plated brass, stainless steel, and anodized aluminum parts. It has 27 balls to mark the hour, every 10th minute, and each minute. Time Machine Ball Clock: transfers chrome balls every 60 seconds to keep track of time. Pretty fun to watch. Redundant Clock: this aptly named clock has has 12 hour and minute hands instead of regular numbers. Barisieur: this alarm clock wakes you up to fresh coffee. What can be better than that? Bacon Alarm Clock: coffee not your thing? This clock wakes you up to the smell of bacon. It is Android friendly. Ruggie: have trouble waking up on time? This clock forces you to get out of bed and stand for 3 seconds to turn off the alarm. Ripples of Time Clock: a beautiful piece inspired by Zen gardens. It has a single hand that forms ripple patterns through the sand over a period of twelve hours. 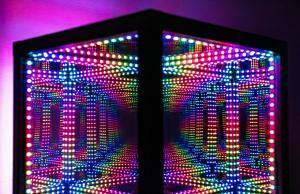 3D POV Clock: was made using a hard drive and Arduino. It spins a set of LEDs really fast to show the time. 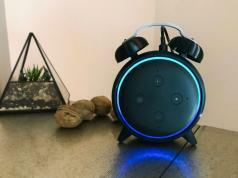 Orbits Clock: has 3 circles that rotate to display the time. 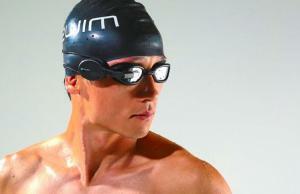 It is made of carbon fiber material. Orbit Planet Clock: another elegant clock for astronomy fans. Uses hidden magnets to pull the planets around. 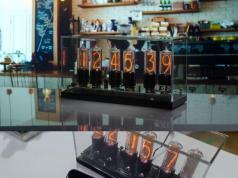 Steampunk LED Clock: a beautiful clock that displays the time with LEDs. It was built with an Arduino UNO. 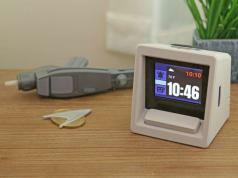 Hard Drive LED Desk Clock: made from a 3.5″ HDD and has a LED display. Shows both analog and digital times. Throwing Alarm Clocks: looks like a grenade and can be turned off only when you throw it. 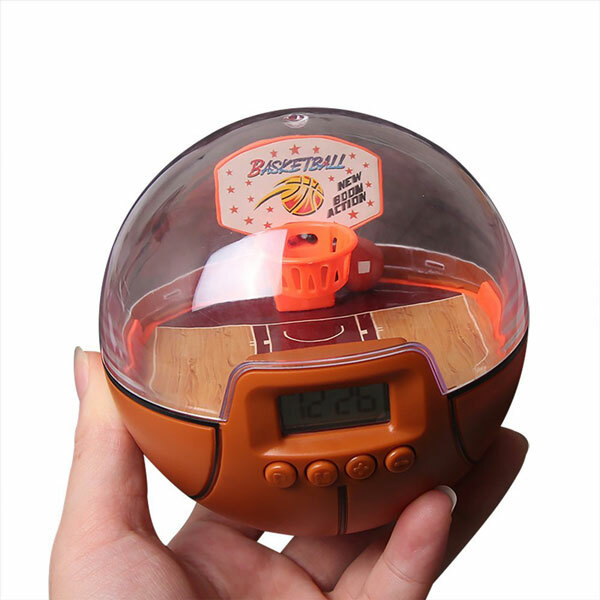 Lexvss Basketball Clock: lets you play basketball anywhere. You can also use it as an alarm clock. Forces you to make shots to turn it off. Have you found cooler clocks? Please share them here.